If It's Too Loud...: James Williamson and Petra Haden - "Blues Jumped the Rabbit"
James Williamson and Petra Haden - "Blues Jumped the Rabbit"
To continue his collaborative singles series, James Williamson (Iggy and the Stooges) has teamed with Petra Haden (That Dog, The Haden Triplets) for "Blues Jumped the Rabbit." While his previous single with Lisa Kekaula was traditional Hawaiian and children's music, his collaboration with Petra Haden is very traditional blues and folk. It's a wild change from the proto-punk riffs Williamson churned out in The Stooges and Haden's 90s alternative That Dog and much more in line with The Haden Triplets. It's a beautiful and melancholy song. Also, the single benefits Project Hawai'i which benefits homeless children in Hawaii. You can listen to "Blues Jumped the Rabbit" below. For more information on James Williamson, check out his website. For more on Petra Haden, check out hers. 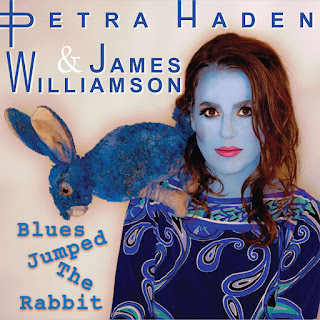 "Blues Jumped the Rabbit" is available digitally now with a physical release date of August 19.